Rustic Village Houses, Dark Walnut Wooden Houses, Little Wooden Houses, Decorative Wood Houses, Handmade Wooden Houses, Christmas Decoration This set of 5 Modern/Rustic Home Décor pieces make wonderful Christmas Village decoration, holiday décor, Kids Toy or interesting accent for your home décor. 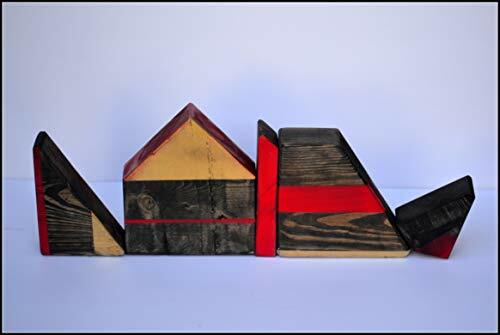 No matter how you use these Modern hand painted houses, each one is hand cut, sanded, primed and paintedto perfection for a rustic and vibrant display. They are so versatile and color popping roofs are sure to grab all the best attention in your Holiday Display or any time of year. Each little house décor piece which includes a set of 5 little houses is unique and different. I do not measure these sets. They are created completely free form with my cutting and sanding tools. I paint each one based on a feeling. These are Rustic and Modern! Not too fussy! Set includes all 5 houses pictured. Sometimes paint is not perfect. At Christmas time just put some decorative cotton underneath and some little fairy lights to make them come to life! Houses are made from 2x4's or 4x8 pieces of RECLAIMED wood that I find, repurpose then hand cut into various shapes. They measure between 4-8 inches tall. They stand by themselves - no support needed. They can be placed on a windowsill or a mantel. Kids love them on a bedside table even! No two pieces are alike. These show signs of wear and paint is meant to be rustic and worn looking. This set is painted with a milk based paint and some acrylic paint. I use what is available. I love making these so if you have some specific colors or cusomization please contact me. I can create a cusom message, family name or other painting technique to suit you. Just ask! In my shop PricklyPaw, (www.etsy.com/shop/PricklyPaw ) I have over 2000 orders and I do custom work ALL THE TIME. Look forward to seeing what we can create together! If you have any questions about this product by PricklyPaw, contact us by completing and submitting the form below. If you are looking for a specif part number, please include it with your message.